Jeanne Moos reports Sen. Clinton has been all smiles lately. 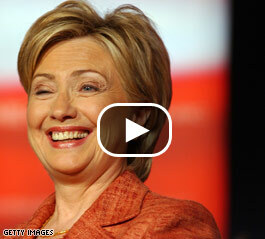 WASHINGTON (CNN) - CNN's Jeanne Moos reports Hillary Clinton's "cackle" is the latest talk of the town. Lighten up, America! We need more Hillary's laughs! If you tell me she is faking, try that yourself. Soooooo like the witch she is. Is CNN discussing Hillary's cackle or cankles? Which is it because she has both? The fact that there are so many comments here about Hillary Clinton's wardrobe, hair, laugh, and overall appearance further encourages my sinking feeling that America as a whole is getting DUMBER. I'm behind you Hillary. You can wear a tutu, football helmet and Big Bird slippers, get on national TV with bedhead, and laugh all the way to the White House as far as I'm concerned! It all has nothing to do with the relevant issues.